Thank you to everyone who participated in the Kickstarter for Paradise Fallen! The game was successfully funded and published. I received a few copies myself, and it's been exciting to see it out in the wild, including in friendly local game stores. Now that it's out, you can read about it on Board Game Geek, or purchase a copy on Amazon if your FLGS doesn't have any. It's been a wild ride, and I'm grateful for my friends and family for their support, to Patrick and Crash Games for taking a chance on my design, to Jason and Darrell for the the visuals, and to everyone who's sat down and play-tested the game along the way. The Kickstarter campaign was a success! Woohoo! Thank you everyone who decided to come along on the journey. "The Expanse" is now "Paradise Fallen" and on Kickstarter! Pre-order the game / pledge here! "The Expanse" has been picked up by a publisher: Crash Games! 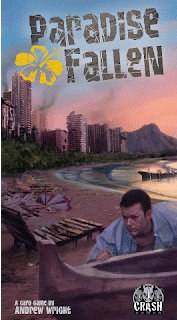 As is sometimes the case, the publisher has asked to publish a re-theme of the game, and I agreed. Ready for the new theme? Post-Apocaliptic Hawaii. No zombies, just a mysterious event that has reduced civilization to bands of tribes. 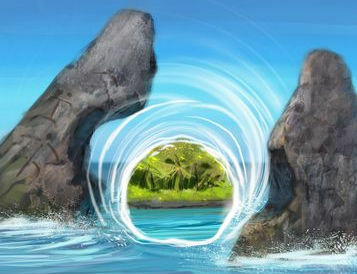 The name of the re-themed version is "Paradise Fallen". There's a plan for this theme to continue though multiple titles, so it's kind of cool that my game got to be the first. The rules have been tweaked a little, but the basic mechanics remain the same -- it might even be more fun now, who knows? Why am I bringing this up now? 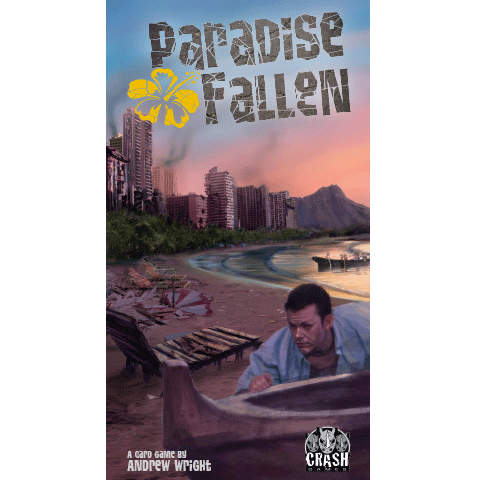 Well, as is often the case now days, "Paradise Fallen" is up on Kickstarter and hoping to get enough money to do a proper print run. I am still proud of the print-on-demand version that I produced on my own, but I'm also very excited to see this new version come out. It'll have all original artwork, custom player markers, tokens, a sturdy box, the works. One copy, sent anywhere in the US, will run just $20. I'm hoping you'll take this opportunity to pick up a copy and make sure the game gets made. Thanks! There are a limited number of copies of the beta expansion for The Expanse that should be floating out there by now. If you happen to have one of them, and are wondering "how does this expansion work?" you've come to the right place. You no longer need to worry about needing to discard duplicates with the new rule above. The first, and most straightforward is to simply remove three of the current Locations and their matching Explorations cards, and put these new ones in in their place. This leaves the rules unchanged, and allows you to try out different combinations of cards. Keep in mind that more higher-cost Locations will result in a slightly longer game on average. Please let me know if you have any questions, or if something does not make sense, using the email address on the expansion cards, or by posting it here. Thanks! The first thing I learned about launching a game in a big room is that you need someone who can yell well, because apparently I cannot. Thankfully, better-voiced people took pity on me and re-shouted the announcements about the game. For a first-timer, I felt that the launch went very well. People signed up to play the game, others stopped by, and there was a lot of positive feedback. At one point there were three games going on simultaneously. There were smiles on the faces of those playing, close games, and at least one come-from-behind victory. CritsHappen.net was there and took quite a bit of video of the Board Game Bash, including some footage of the display setup and the game being played. Click this link to go right to the footage, or you can watch the whole video here. Towards the end of the evening, I was able to show the game to Justin De Witt (designer of Castle Panic), Anne-Marie De Witt (Designer of Bears! ), and CW Karstens (Designer of Dragon Valley). Both Justin and CW had played the game over a year ago at Protospeil South, when it was still called Neon Trucker, and commented how far it had come, both in gameplay and appearance. It was quite a busy day, and I wish that there were more hours in it, but I left happy. I had been able to share something with people that I have put so much of my time and effort into, and had a great time doing it. 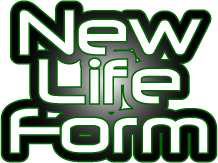 Welcome to New Life Form Games! We are very excited to announce that we'll be at the Austin Board Game Bash on the 4th of August for the official launch of our unstable galaxy exploration card game: The Expanse. If you're there, stop by and try it out! Thanks for visiting, and let us know what you think of the website!